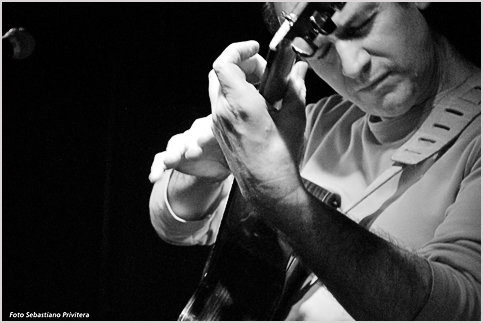 Giovanni Palombo is a guitarist and composer who, as a contemporary acoustic fingerstylist, acts in complete authenticity, and he is just as natural when acting as a member of various ensembles ranging from ethno-jazz, folklore to modern acoustic chamber music with an improvisational touch. He is not only a fabulous solo guitarist, but also has a special predilection for using the possibility of intimate chamber music ensembles. In Palombo’s music, Mediterranean melodies fuse with chords to form a dense construct of sound upon which the improvisations of his musical partners can elegantly spread themselves out. The compositions of the Italian artist are moving and playful, his special talent is being a skillful and sensitive accompanist. The core of the eleven new compositions consists of Palombo's observations of the beauty of nature in the Mediterranean region that he manages to set to instrumental music in an imaginative, emotional and pictorial manner. Giovanni Palombo’s musical microcosm is characterized by an original amalgamation of Mediterranean melodic phrases, impressionistic harmonic progressions and jazzy improvisations.